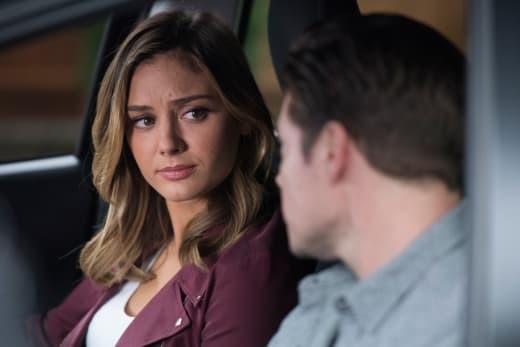 Megan should have known that Kyle's words were too good to be true on The Arrangement Season 2 Episode 9, and she was too quick to jump on board his plan when he offered it. Kyle's plan to confront Terence when his guard was down was a good one, but Megan should have put some safeguards into place first to protect the people she put into danger. It was stupid of her even to think that Kyle would give up Terence and IHM in one fell swoop. They are too rooted to each other for that to happen, but that's Megan living in la-la land. Shaun was right when she told Megan she was crazy for telling Kyle everything. Megan's thinking might have been to lay it all on the line and see what happens, but it wasn't very smart. She knows what kind of person with whom she's dealing. Besides, wouldn't the warning bells have gone off at how easy it was all falling into place? How could she not think Terence wouldn't come at her full force in his own special way which is why she should have made sure Julie and Aaron were safe before they went ahead with Kyle's plan. She's done enough sneaking around; she could have put them up at a hotel until she saw how everything played out first. Now, she has no idea what happened to them, and she's once again at Terence's mercy. And this time it's worse because Terence told her if she doesn't follow through on her contract, her little secret about murdering her brother (albeit in self-defense) would be revealed. Girl, you really screwed yourself. Kyle's plan to confront Terence at the rehearsal dinner was brilliant but risky. The entire exchange was the highlight of the installment. I can only imagine how hard Megan's heart was pounding because I know mine was! You have to give Megan props for at least standing up to Terence at that moment and thinking she won. It certainly seemed that way, but this is Hollywood, baby, and nothing is as it seems. And Megan should know this!!!! I know I keep harping on the same things week after week, but I can't believe how Megan has been in how she has approached the entire situation. She had so many chances to leave and get out before it was too late but turned her nose at every opportunity. Now, it really is too late. Whatever Terence meant by needing a "permanent solution" to deal with Megan is not a good thing. We've seen some of his other permanent solutions, and they didn't turn out very well for the person on the other end. Deann was a little flipped out at the turn of events. She knows what Terence is capable of and tried to warn Megan, but that girl is so thick-headed the thought of what might happen to her didn't even tickle the outside of her head. Deann will be lucky if she survives this whole ordeal herself. This is why she was so quick to admit to Terence her mistakes with Wes. She knows how dangerous Terence is and knows that she has to appease him to live to see another day. He can get rid of Deann as easily as he can get rid of Megan. I'm not sure how Shaun fits into it all yet. Part of me wants to believe that she was telling the truth when she told Kyle that she stood with Megan, but when Megan was telling her everything that had happened with Julie and Aaron, I was half expecting to see Terence's hand fall on Shaun's shoulder. It could very well be that Shaun told Terence where Julie and Aaron were staying. I can't believe Terence wouldn't have confronted her knowing that she was with Megan during the trip to Paso Robles. Even if Terence didn't confront Shaun, you know it's right around the corner. Terence isn't stupid. He has to know Shaun was involved, and she will be dealt with appropriately. It wouldn't surprise me if she suddenly disappeared, just like Zach is about to disappear. Kyle may think that he's sending Zach off to live a life free of IHM, but what are the chances of that happening? Megan's world is about to collapse. She stepped into a nightmare, and it's about to get worse. I'm not entirely on board with her running to Xavier and involving one more innocent person in this sick web, but I understand why she went to him. He's the only one left she can turn to and trust -- even if it means playing on his emotions towards her. She doesn't love him. She's not even remotely interested in him, but she knows he'll listen. She also knows that sleeping with Xavier will be a punch in the gut to Kyle, and she desperately wants to hurt Kyle as deeply as she can. But, in doing so, she's just destroyed someone else's life. Will this girl ever learn? Will Megan and Kyle make it to their wedding or will Terence step in to stop it? Will Kyle find out about Xavier and Megan? What will he do? What happens next in this saga? 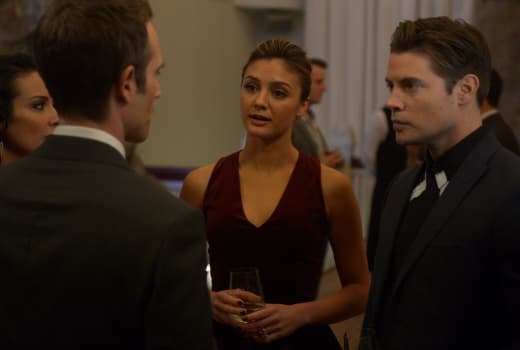 If you need to catch up, you can watch The Arrangement online right here via TV Fanatic!